Photo: PATH/Trevor Snapp. A young patient is examined at Usa River Health facility in Arusha, Tanzania. Data use and data quality interventions place health workers in the drivers seat, and lessons from Arusha will directly benefit health workers and their patients as the BID Initiative expand to Tanga and Kilimanjaro. There are 285 facilities actively using interventions aiming to improve data quality and use; 81,735 children registered in Tanzania’s electronic immunization registry (EIR); 672 frontline healthcare workers (HCWs) trained on these interventions; and 48 district immunization mentors (DIMs) appointed, trained, and deployed to support HCWs in the health facilities that provide immunization services. This January, the BID Initiative completed rollout in the first demonstration region of Arusha. Many partners made this success possible: The government of Tanzania, data use champions, and the many frontline HCWs who were willing to participate in the designing and testing of data use interventions and the EIR for the first time. Graphic: PATH/Shawn Kavon. 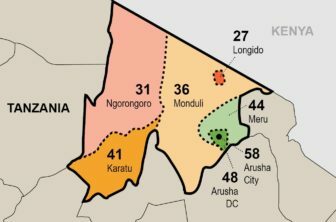 Above, a map of the number of facilities implementing interventions to improve data quality and use in Tanzania’s Arusha Region. As with any pioneering initiative, there were hurdles and lessons along the way. Fortunately, we have the opportunity to apply these learnings to our next demonstration regions of Tanga and Kilimanjaro. In fact, Arusha’s success has implications far beyond Tanzania. Our learnings speak to the importance of engaging stakeholders at all levels of the health system, and can be used to harness future system-level data quality and use investments in areas such as maternal and child health, HIV, malaria, and tuberculosis. The completion of Arusha has sentimental value for me. I joined the BID team just over a year ago. As the team expanded implementation efforts from Arusha City to Meru District, we found ourselves overstretched. Even as we convened and rolled out the program and trainings in Meru, we continued to support the health facilities in Arusha City. We found ourselves commuting long distances between either district and less able to respond to the daily needs of health workers adjusting to a new way of working and a suite of tools that were still largely new to them. That moment proved to be a turning point for the BID Initiative in Tanzania. We realized how critical it was to reexamine our rollout approach. Regional and district government officials would need to be even more prominent in our strategy. We continued to make a deliberate effort of leading from behind, working first in Karatu District, before further refining our approach as we expanded across Arusha. Health workers themselves – the very people using these systems – continue to be in the driving seat. Implementation should be led by local healthcare workers to foster sustainability from the start. Early on, the BID team led implementation activities, but as we expanded to other districts, we realized that it was important to take a step back. Our refined strategy now selects immunization mentors from among district authorities. After the district immunization mentors (DIMs) undergo a thorough training, they provide direct support to healthcare workers at facilities in their districts. Generating buy-in from within the health system, ensures country ownership and sustainability. District authorities are now exploring ways to maintain financial support for the DIMs as we expand to other regions in Tanzania. DIMs are a critical investment for the sustainability of data use and data quality interventions, and are essential to the success of frontline health workers. District immunization mentors should have basic computer skills. As Tanzania advances its eHealth strategy, and moves toward a fully digital health information system, basic computer literacy will be critical to the success of district immunization mentors. DIMs must be computer literate to be able to perform multiple tasks at a district-level, and to scale up other electronic systems. This deeper understanding ensures that they are able to troubleshoot the challenges that arise with expansion. If a tablet crashes, DIMs can take things into their own hands, instead of relying on external technical support that may be remotely located and overburdened. Change management strategies should focus on data use to improve service delivery, instead of only the tools. 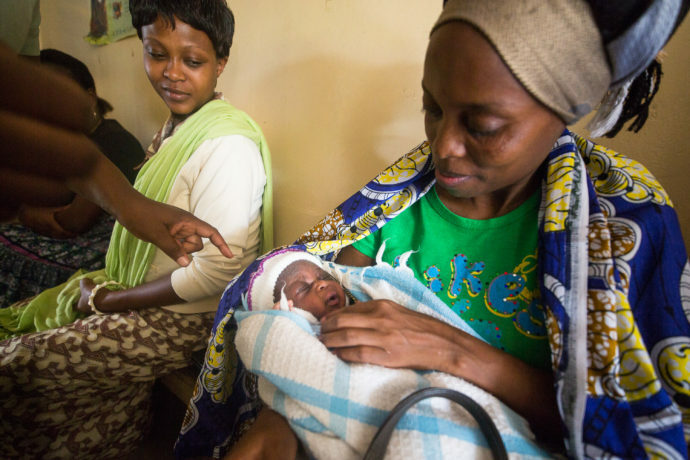 Though it’s natural to center the flashy new smartphones, tablets, and futuristic barcode scanners that accompany data use interventions in Tanzania, change management strategies need to focus on the improved health outcomes that are likely to motivate health workers to adopt a new culture of data use. New tools and technologies can often be the most tangible examples of change, but they are just that – tools. Health workers need to understand how these tools can help them see the value of data, analyze it and use it for decision making. By focusing on data use, health workers are empowered to interpret and act upon the trends and numbers they increasingly have visibility into. Change management strategies should complement health worker learning styles. Micro-training videos were one of the data use interventions introduced in Tanzania. The short films depicted best practices for data use and immunization service delivery and included brief tutorials on how to use the new technologies, including how to power on the tablet, how to log in and out of the system, and how to touch and manipulate tablet screens. We soon learned that health workers required a more participatory method of learning. For many, music videos were their only reference point for the medium and they rarely set aside time to watch the training videos. At the same time, some of the other mechanisms developed for delivering data use messages were more effective. For example, peer networking tools, such as WhatsApp groups, help nurses to process, communicate, and share their experiences. The completion of Arusha Region is a remarkable achievement for the BID Initiative and the government of Tanzania. But we’re not done yet. Already, we are seeing the government’s support as several districts provide financial resources to sustain the interventions. As we expand to Tanga and Kilimanjaro, the government will be in the driving seat, starting with sensitization efforts. Our lessons from Arusha reconfirm the importance of true country leadership to the success of any initiative, and as the interventions scale, we are sure to benefit from our learnings in Arusha.